This is how the company explains the new login. Several have responded to a change Google has made in Chrome 69 that automatically logs users into the browser when they log in to a Google Account, such as Gmail. Among them, security scientist Matthew Green discovered that by accident. In a blog post, Zach Koch, Product Manager for Chrome, explains the idea behind this change. He points out that even if you log in to Chrome automatically when you log in to a Google Account, it does not mean that Chrome sync is enabled. This is one of the points users have been worried about, but Google ensures that browser history, passwords, and bookmarks are not synced before activating it manually. "The new user interface reminds users which Google account is logged in. More importantly, it allows us to help users who share a device. For several years, we've received feedback from users on shared devices that Chromes login status can be confusing. We believe that these changes make sure that users do not search or visit websites that can be saved to another user's synced account, "explains Chromes Product Manager. It will be possible to disable link between web-based login and browser-based login. Users who disable this feature will not automatically log in to Chrome when they sign in to a Google page. An update to the user interface should clarify the sync status. It should be easier to see if Chrome syncs or not. Google will make changes to authorization cookies. In Chrome 69 (the latest edition), these are retained so that the user remains logged in even if the cookies are deleted. 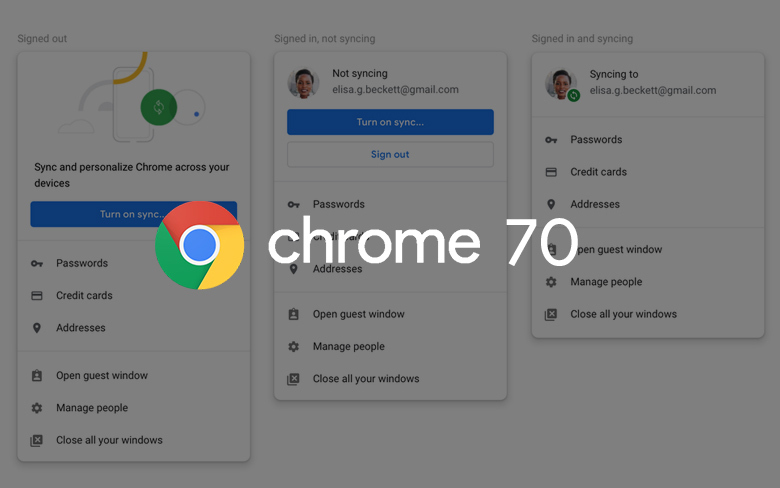 In Chrome 70, all cookies, including authorizations, will be deleted and you will be logged out. Chrome 70 is expected in mid-October. What do you think of Google's changes?